The Broke and the Bookish : Top Ten Tuesday: Stephany's Top Ten Favorite Authors! 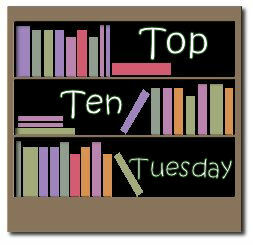 Top Ten Tuesday: Stephany's Top Ten Favorite Authors! I was actually quite excited to participate in this weeks Top Ten Tuesday! I have quite a few authors that I follow closely and read every single one of their books, as soon as a new one is released. So, I figured this list would be a bit 'easier' for me then past lists have been!! So, without further ado, here is my Top Ten Favorite Authors (In no particular order)! Have you read any of these authors? Do you enjoy them? Why or why not? Are any of these authors going on your lists too? Please share with us!!! I just discovered this meme. I would love to participate! I love making lists. That is a great list. I agree with Jodi Picoult. I like reading her books. This is what I like about seeing the same kind of list from many readers - the difference in taste and preference. Yikes, I haven't heard of half of these, let alone read them! Props to you for being so dedicated to your favorite authors! Can't say I have really read any of your authors! Aside from Stephanie Meyer! Love how diverse this blog is! All 12 of us would have had incredibly different lists! Wow, my authors are all different from yours! This is a great way to get to know bloggers and discover new authors. Wow, you read every single one of their books? Impressive! What is cool about this list; it is different than mine, and I like getting a peek into other's choices. I've heard of about half of those. Definitely different tastes than mine :o) Thanks again for hosting this fantastic meme! I've heard of maybe...three of those, and never read any! I started working on my list last week, but narrowing it down to ten was tough. Oh-- Karen Kingsbury is great-- I have read a lot of her works! Just found this meme -- very excited about it. Not to mention next week's question! Can't wait for it! Long time lurker, first time participant. This was a good starter question for me -- next week's one will surely spark some interesting discussions! Has anyone else noticed that the girls' lists are almost all female writers and the boys' lists are almost all male? haha. Good idea for this blog. It was harder than I thought to create my list. I got so freaked out trying to make my list! Totally over thought it. Could I include Mantel even though I've only read three of her books? Was it too obvious and boring to say Austen and Atwood? Got caught up in all sorts of booky-angst and had to stop! Another thought provoking question! I had a very difficult time coming up with my top ten! Just discovered this meme this morning! Love it! A bunch of the blogs I follow participate in this meme and as it is the first one I've done I am pretty excited. Thanks! Yep! I've read every single book from these authors. Only books I haven't read yet (obviously) are ones that haven't been released yet. Once I read one book by an author, if I fall absolutely in love with it, I will try all of the others book and 9 times out of 10 love those too. As for the other questions/comments.. you can have any authors you want on your lists! Doesn't matter what they write, if they're a favorite.. add them! This is great! I used to do a weekly feature called Ten for Tuesday on my blog, with a weekly top 10 list. I haven't done it in a while, and just discovered your very similar meme! Hi there, I've already joined and will be joining in the future. Love it. I have not heard of some of your favorite authors!! Way too many books..too little time!!! Loving your list ideas - please keep the coming!